In June of 2016, J.K. Rowling published “Ilvermorny School of Witchcraft and Wizardry,” revealing that the American version of Hogwarts is on top of Mount Greylock in Adams, Massachusetts. M.A.G.I.Con was created by volunteers from Adams to celebrate this fantastic news. Please join us and your fellow fans of wizards, wands and magic at M.A.G.I.Con 2018! Alohomora! Tickets will go on sale May 25. $20 each day, $35 for both days, kids 12 and under free! Click here. Harry and the Potters will be Rocking and Rowling... oh, yeah! Banish Misfortune plays traditional music from Ireland. Their instrumentation includes fiddle, concertina, mandolin, accordion, flute, and guitar, with which they perform rousing sets of hornpipes, reels, jigs, waltzes, slides, polkas and airs, as well as the occasional inspired song or accompanied Irish poem! Lauren is a YouTube content creator, singer-songwriter, crafter, and Hufflepuff who makes cute things inspired by the stories she loves. Lauren has written original acoustic guitar music about The Prince's Tale, Luna Lovegood, Moaning Myrtle, and a variety of YA novels. She's possibly best known for her songs about being part of the Harry Potter fandom and for the emotional audience response that results from her live performances. The Whomping Willows is a botanical wizard rock band from Providence, Rhode Island. Named the Greatest Wizard Rock Band of All Time by the (perhaps biased) Ents of Fangorn Forest, the band has played 700 shows across the United States, Canada, and Europe since 2005. Dress accordingly! You might win a prize in our Improved Costume Contest. Click here for the rules and how to register. Enjoy a local brew from Bright Ideas Brewing and food from an expanded selection of local restaurants, including veggie options. Procure your mischievous merchandise from our magical vendors. We've tripled the number of vendors this year! M.A.G.I.Con will be held outdoors in the beautiful Greylock Glen at the foot of Mount Greylock, home of Ilvermorny. Bring lawn chairs or blankets, please be prepared for rain. Sorry, no outside food or beverages allowed. Click here for map, directions and shuttle information. M.A.G.I.Con will take place off a narrow rural road. Parking at the venue will be extremely limited. Unless you are brooming in, we STRONGLY recommend you take the shuttle. Thanks to our lead sponsor! Greylock Federal Credit Union helped to make this event free for the kids. With additional support from the Town of Adams. Follow us on social media to join the discussion and keep up with the latest news. All proceeds from M.A.G.I.Con will go to ProAdams, Inc., a 501 c-3 to support its mission to bring cultural and economic vibrancy to the Town of Adams, Massachusetts. Professor Perkins is a full blood witch from the mountains of North Carolina. Throughout childhood, she showed an affinity for nature and an early aptitude for magic, excelling in potion work when she entered her schooling at Blue Ridge School of Herbal Medicine & Blazing Star Herbal School. She holds certifications in herbalism from her time spent intimately studying the magic and healing properties of plants. Professor Perkins also spent three months traveling the Appalachian Trail, gaining an even greater appreciation for the gifts of Earth. In this workshop titled Herbology 101, Professor Perkins will cover the basics of plant medicine & the magic that lies within them. Michael Clough of the Southern Vermont Natural History Museum will present a demonstration on the Real Fantastic Beasts of the Greylock Region. His animals are in the care of Professor Clough because they are either badly injured or unwanted pets that would not survive if released back to the wild. He will speak on the important topic of protecting wildlife and the habitat they need to thrive, as well as on the magical abilities of these fantastic creatures. 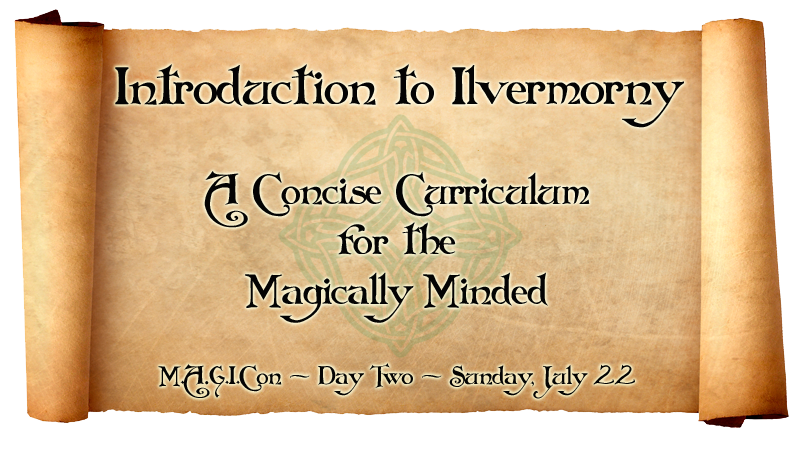 Professor Baisley will be conducting a class on Divination on Sunday July 22 at M.A.G.I.Con's Concise Curriculum for the Magically Minded. Darlene Baisley has been providing healing and insightful consultations for nearly 30 years. A natural intuitive, with a background in the field of social work, she is also an expert with Tarot, Reiki and Channeling. Combining unique insights with her spiritual gifts, Darlene helps open her clients hearts and minds to the beauty of who they truly are. It is her intention to inspire love, acceptance and abundance in all of the people she advises. Professor Malvina Lestage's family settled near Mount Greylock many, many generations ago. Some of them were among the earliest students at Ilvermorny. Lestage showed an affinity with potions at a young age and was admitted into Ilvermorny's Pukwudgie House. After her time at Ilvermorny, she took the unusual (and some say, iconoclastic) path of pursuing a no-maj degree and career in biotechnology before returning to Adams and Ilvermorny. Much to the annoyance of magical purists, she continues to teach at a nearby no-maj school... naturally, she adjusts her courses to a level that the less fortunate children can understand. In this workshop, titled Potions: A Primer, several potion recipes will be prepared before your eyes. Volunteers from the audience will be needed to assist in the concoction of these magical mixtures.